When I was single, I always thought, geez what’s wrong with these ladies? When I have a boyfriend one day, I’ll let him play FIFA (or WE for that matter) as long as he wants, I even will play with him all night and I’ll be the coolest girlfriend ever. When I have a boyfriend, I will never interrupt his buddy boy time, he can be out as long as he wants. When I have a boyfriend, I will hang out with his guy friends talking about football and girls. Well, single May, those are bunch of horse craps!!! No women would let the man just sitting around do nothing but play fifa. No hell way! Yes you can do that with your male buddies which I had a lot back then and all we did was hanging around all day do nothing but play games or play card games or sing along with guitars and just haaanggg, talking about football and chicks. I was the coolest female friend any men could ever had. But once the man turns to be your boyfriend, he is set to be some awesome grandeur hero that you want. AND IT’S OKAY, LADIES! It’s okay to set certain expectation for your boyfriend, especially when it is a serious relationship and you vision him as your future husband. Yeah you can have your FIFA time but not ALL DAY!!! two or three hours are okay but not prioritizing the game over us! That’s not right! I hate it when men said we, women, don’t understand them. You freaking chauvinist dumb, if we don’t understand you, we won’t ever want to tolerate your stinky socks, your stupid jokes, your messy cereal crumbs, and all your other bad habits. We weren’t built for living with those craps, but we do compromise! We always ALWAYS try to understand men, but do men try hard enough to understand women? No, I don’t think so. And we’re pushing you to be better is not because we hate to see you’re having fun with your games, but we want you to be better. Not only be a better and more responsible man for us, but also for our future kids. Men expect women to accept them in bad times, when men didn’t have a single cent on their pockets. Men wants women who see them when they had nothing. I agree with that. But please don’t stay there. When a woman, one special woman has come to your life when you had nothing, don’t you want to strive everything for her? Prioritize her above anything, even above your stupid game? Be somebody that she will be proud of, not just some lame lazy gamer?! Man up! When you have a boyfriend, you’ll make him understand that it is not cool to treat girl any less important than games. When you have a boyfriend, you’re gonna be cool with his friends but not necessary means always hang around with them. When you have a boyfriend, he’s gonna be that man you’ve always wanted, not LESS. You deserve the BEST for you, not the second best. 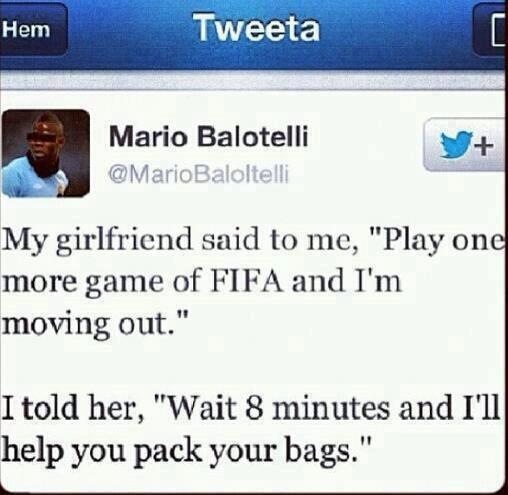 I know I probably took the Balotelli’s joke too seriously. However he’s Balotelli for god’s sake, he does stupid things in his own childish ways (But I must still have to support him as long as he’s in Italian National Squad). Anyway, it’s not only because of Balotelli’s joke itself, it’s just too much chauvinist jokes in the internet and I feel like I should make a post. You don’t need to be a feminist to be offended anyway. For a relationship matter, I’m an idealist, and I will always be. This entry was posted in Growing up, Lover's Tales, The Sanguinism of the Journal and tagged boy and games, Chauvinism, Feminisim, Gaming, growing up, idealist, Mario Balotelli, Relationship. Bookmark the permalink. Amen, sister ! :D Well said. May, if I can hit the like button on this post a million times, I would, trust me, hahaha. Like you as well when I was single I thought the same way, “I’d be the cool gf who’d let my dude play video game/do his hobby ALL the time and I’ll be okay with hanging out with his buds ALL the time.” Well guess what I’d figure, adult relationships don’t work that way, hahaha. If a dude isn’t ready to put the relationship (and the work that comes with maintaining it) as one of his important priorities, then he doesn’t have any business being in one to begin with! I think one of the defining trait of maturity is the ability to figure out how to maintain a healthy relationship and keeping our own personal identity ( hobbies, social life,career/academics,etc).. and that goes for both ladies and gents. Also for that misogynistic do*chebag with that tweet up there? go die in a fire. Yeah!!! That’s the point! They have to work on the relationship! It doesn’t run itself. Hahaha. You’re so freaking awesome, Wu! Let’s set him on fire! ahahahahaha.. iya sebagai istri seorang gamer yah, saya mengerti rasanya dicuekin seharian selama dia berusaha melawan kekuatan jahat di dunia diablo. tapi tetep tugas cuci piring ga boleh kelupaan. *pegang pecut*. in the end I its all about balance ga sih. yah yang penting yang dalam hubungan (pacaran/suami istri), yang namanya man and woman itu harus equal. partner. team. jadi ya harus saling menghargai, menghormati, toleransi. Point taken. Yes, yes , of course, you’re right. Absolutely. Definitely. On condition we agree that – grosso modo- men and women are bound to live through frequent mutual misunderstandings. I think that’s what makes relationships spicy and fascinating. Of course – vive la petite difference- generally speaking women don’t understand men any better than men do understand women. One of these misunderstandings might be we will eventually succeed in changing our lover to live up to our expectations. Yeah, I agree that sometimes his tweets are funny. I enjoyed most of his jokes. But he’s still seriously in need for treatment. I guess we agree on that.